Tintern Abbey: Frank Baines, Architect in charge of Ancient Monuments and Historic Buildings, specified in 1911 that no cement was to be used on the face of the masonry, and that Blue Lias, Aberthaw or Arden Lime (moderately to eminently hydraulic limes) were to be used exclusively in the consolidation of wall tops and facework. As a nation, we have largely forgotten about hydraulic lime in our building industry. The revival of interest in non-hydraulic lime putty which received its main stimulus from building conservation and especially the great 'West Front' projects at Wells and Exeter in the 1970s was not generally extended to hydraulic limes. We have largely deprived ourselves for some 50 years of a range of traditional 'setting' limes which were once the backbone of masonry construction. Any treatise on mortar since the work of John Smeaton in the mid 18th century and until the 1950s, recognises the important role of hydraulic limes in the context of mortar and plaster. For certain types of work, these limes were the most appropriate material. Study of pre-war texts on lime and cements is to be highly recommended as an antidote to some of the 'all or nothing' modern attitudes to lime and cement, especially when supported by site observation as a way of understanding the nature and use of hydraulic limes. Lime is the traditional, ancient binding medium of masonry. Until the advent of artificial cements and especially the advent of Portland cement, lime was used almost exclusively and it has never entirely disappeared. Lime is classified according to its ability to set under water, and a formal classification system was introduced by Louis Vicat (an eminent French civil engineer who researched hydraulic limes and cements in the course of bridge and road building). As a result of his work, which was published in the 1830s and 1840s, limes which set under water are known as 'hydraulic' limes (formerly they were known as 'water' limes). Their hydraulic characteristic is produced by 'impurities' of silica and clay in the limestone from which they are burnt. When limestones containing silica and clay are burned, the clay decomposes at between 400ºC to 600ºC and combines at 950ºC to 1250ºC (the top end of the burning temperatures for hydraulic lime: sintering takes place at 1300ºC to 1400ºC) with some of the lime, forming silicates and aluminates, especially tricalcium silicate and dicalcium aluminate. The lime produced consists of a mixture of quicklime (or 'freelime'), cementitious material and inert material such as silica or uncombined clay. Such limes need to be slaked with enough water to convert the quicklime to calcium hydroxide, but not so much that a chemical set begins. Burning and slaking procedures are thus more complex than those associated with the production of chalk or other 'pure' limes, but the materials produced are far more versatile. Under the general classification of 'hydraulic' are subdivisions suggested by Vicat and later generally adopted. These subdivisions are important since they relate to the performance of each type. Table 1 shows the classification system with relevant characteristics. The properties of the hydraulic limes depend on their composition and the burning and slaking specification, and it is essential that when hydraulic lime is to be used to know the facts. Thus, a supplier should make known chemical analysis and production data or so guarantee the purchaser against failure that such data is not required. The Table 1 categories of 'feebly', 'moderately' and 'eminently' hydraulic, which are 19th century in origin, were sometimes re-named in the 1930s to suit reduced availability and use. Thus, 'feebly hydraulic' became 'semi-hydraulic' and 'hydraulic' related almost exclusively to an eminently hydraulic Blue Lias lime. Non-hydraulic lime is available from over 40 suppliers (UK and the Republic of Ireland) in the form of putty and from most builders merchants in the form of bagged hydrate. Bearing in mind the limitations of 'chalk' lime and the merits of 'stone' lime, much quoted in traditional sources, it is clear that care is needed in selection and specification. The source material of well known limes such as Shillingstone and Totternhoe, Lewes and Dorking are, or were, all taken from the Chalk, but all were categorised as 'grey stone' or feebly hydraulic. These were the limes of much of 18th and 19th century building development. To use a feebly or non-hydraulic lime today is perfectly acceptable, but it must be remembered that what is now available is not suited to exposures such as chimneys, copings, wall heads, weatherings, quoins or paving and must not be used anywhere during frost-prone months. Durability can be improved by the addition of pozzolanic material such as low-fired, fine ground ceramic powder, but the general limitations described still apply, especially in northern or marine exposures. The great merit of mature putty lime is that it is often highly compatible with weakened, weathered stones and bricks, is able to accommodate minor building movement, tends to act sacrificially within the masonry face and is ideal in consistency for pointing, face repair and plastering. In other words, it is often the perfect material for the conservator. Referral to traditional texts, recommended above, must be made with the context firmly in mind. 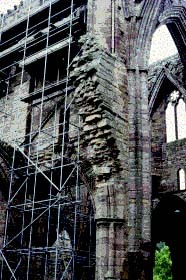 Conservation of historic masonry faces is not the subject of these traditional treatises. Non-hydraulic lime, as well as feebly hydraulic lime, can perform better than any other, in the right hands, for conservation, for many internal locations or for sheltered summer work. Lime putty should be matured, in excess of one month, wet stored with aggregates or blended in a mortar mill with aggregates. In the absence of a mill, hand ramming and beating is the ancient and modern practice to produce the best results. Slow curing and humidity control are significant to the final performance. Building limes, and limes suited to more exposure than the last category, fall into this group. The famous limes produced from the lias formation, especially in the south of Britain where the stones are more calcareous than the north, gave their name to hydraulic lime in the earlier part of this century, so that 'Blue Lias' became synonymous with 'hydraulic lime'. The useful deposits consist of clays and marls with prominent thin-bedded limestones. Blue Lias limestones have provided a range of hydraulicities due to the varying composition and the method of burning. The welcome return of a Blue Lias supply at Charlton Adam is currently in the form of a 'borderline', that is a lime at the high end of the feebly hydraulic and low end of the moderately hydraulic. The tradition in Britain was always to slake hydraulic limes on site and differed in this way to continental practice. One of the most interesting and extensive uses of Blue Lias lime was in the conservation of HM Office of Works Ancient Monuments and Historic Buildings. In 1911 Frank Baines, Architect in Charge, set out procedures which survived until the early 1970s, when hydraulic lime ceased production in the UK altogether. A standard mix of two parts hydraulic lime to five parts of well graded aggregate was recommended at this time. Blending and slaking were carried out together, in a pit or metal bin, by putting in alternate layers of sand (5") and ground hydraulic lime (2"), watering the sand every time and finally cutting through and mixing it by hand with a little additional water. The blended material was then heaped on a boarded platform, polished with the back of a shovel, and left overnight or for at least 12 hours until it was 'cool'. Slight expansion of the slaking material took place during this time. Any material which had begun to stiffen was rejected. The damp sand method was adopted to avoid the over-watering associated with rose sprinkling, which was observed to destroy some hydraulicity. Lime needed to be freshly burned, although a certain amount of airslaking was not considered harmful beyond retarding the setting. Whether or not the quick lime is slaked on the production line in a hydrating plant or partially slaked, or unslaked, must be absolutely clear. The simplest method is to receive a dry, ground, slaked material. If this is not possible, slaking and preparation to the 1911 procedures must be followed. Limes in this category tend to be pale buff to cream and are relatively fat and workable. Properly mixed, placed and cured, they have great versatility, but should not be used in very demanding exposures such as copings, chimneys and pavings. Their initial setting time varies between four and 12 hours. Moderately to eminently hydraulic limes are not currently manufactured in the UK. Principal imports are from France, Switzerland and Italy. In the continental tradition, these limes have been burned, ground and slaked (hydrated). They may contain pozzolanic additives to bring them to a standard, such as cement (some French imports) or volcanic ash (some Italian imports). The popular conception, adding to their convenience, is that they are used in the same way as cement and may be used in all seasons. These ideas need to be qualified. These limes are harsher to work than putty lime or feebly hydraulic lime. The practice of adding a trowel-full of putty to aid plasticity need not be ruled out, but is obviously difficult to specify and control. The inclusion of limestone, especially with a percentage of crushed chalk, will enhance plasticity and fatness. In common with other limes and in spite of the fact that these limes will set in water, slow curing, up to one week, is recommended. Work must not take place when the temperature is 5ºC and falling. Moderately to eminently hydraulic limes have great versatility and may be used on copings, chimneys, weatherings and pavings, as well as for bedding ashlars, rubble and for plastering. Their relatively quick-setting property and early hardness must not be confused with superficially similar properties in cement. These limes retain good water vapour permeability and the ability to accommodate movement. In view of these characteristics, coupled with salt and frost resistance, it is easy to see why these limes were extensively used in engineering works and have been prized since ancient times. The mortar mixes shown in Table 2 are recommendations based on practice but, whilst conforming in general with suppliers' recommendations, they should not be taken as literal for every circumstance. The point has already been made that the selection of aggregate is of vital importance. Clean, well-graded, sharp sand is the backbone ingredient, while other aggregates have important, but supportive roles. Brick powder is a low-fired (<105ºC) fine particle (<100 microns) aggregate which will react with free lime to form a pozzolanic material. Site and laboratory tests have demonstrated that it enhances frost resistance, although too high a percentage will increase porosity and may tend to decrease flexibility. Soft sand is an aid to workability and can contribute significantly to the final colour. Porous limestone or brick are added to aid carbonation and, by pre-soaking, to feed the mix with water and retard drying. In addition, they aid the development of a macroporous structure which enhances resistance to salt crystallisation and frost damage. The grading should be similar to that for the sand. 15 per cent of limestone dust (below 150 microns) will improve workability. Suitable porous limestones are Portland, Bath, Cotswold or Lincolnshire. Tough impermeable, compact limestones are unsuitable. Each group in the table shows a decrease in strength, but an increase in flexibility (for example; M1, M2, M3). However, these terms are relative; the great advantage of using hydraulic limes is that they have many of the advantages and few of the disadvantages of both a non-hydraulic lime and cement. Experimentation is to be encouraged, but not as part of a building or building conservation contract. The British Standard BS890:1995 'Specification for Building Limes' covers calcium, dolomitic and semi-hydraulic lime, but excludes other hydraulic limes. This standard will be replaced by a new standard based on BS EN 459 - 1 which will extend to cover hydraulic limes (BS EN 459 - 1 1994 Building Lime Part 1: Definitions, specifications and conformity criteria). Hydraulic limes have an excellent track record in building history and have only been missing from the UK building industry for some thirty years. Provided the source stone is well selected, the burning carefully controlled and the hydration, mixing, placing and curing properly carried out, hydraulic limes will perform a range of work consistently well. The term 'hydraulic lime' covers materials which vary in properties such as setting times and strength development, but they are never to be thought of or used as a cement substitute. Lime is lime. Workability, low shrinkage, salt and frost resistance, adequate compressive and good flexural strengths are the characteristics of these materials. They have a long history and a recorded performance history at least since the 1750s. In 1997, there is the beginning of a revival in British production and some excellent imported material from the continent, as there has been since the 17th century. These are materials worth getting to know again, whether for historic building maintenance or for new construction. PROF JOHN ASHURST DArch RIBA EASA(Hon) was, at the time of writing, Director of Resurgam, a division of Hutton+Rostron Environmental Investigations Limited.